SUNROSE® produces well known and appreciated Sun Dried Turkish Figs in the heart of the cultivation area, Aydın, where has the most tasty and quality Figs in Mediterranean region. SUNROSE® tasty and delicious Figs are directly dried under the sunlight, processed with special care and packed carefully in high tech processing plants to serve an excellent product to our customers. Figs are an important source of essential, vitamins and calcium, antioxidant properties. The fiber in Figs may also helps you to lose weight. SUNROSE® produces well known and appreciated Turkish figs in the heart of the cultivation area, Aydın, where has the most tasty and quality figs in Aegean region. Our fig factory is located on 10.000 sqm closed area in Aydın, has the capacity of 5,000 Mt/year and accredited by ISO 22000 & BRC quality systems. 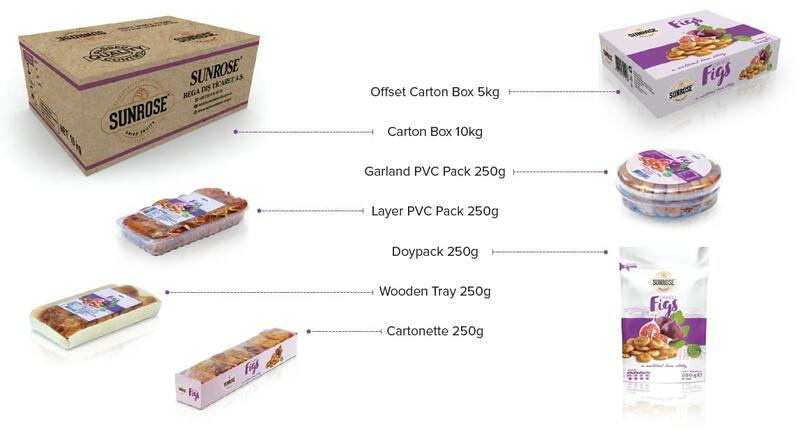 SUNROSE® exports 3.000 Mtons of figs annually mainly to U.S.A, Europe and Australia markets. There are 400 workers and 12 administrative employees working in our fig factory. Among the figs of various origins those produced in the Turkish region are the best and the figs of Aydin area are particularly tasty and have very thin skin. Natural figs are indeed fumigated but not manipulated at all, are supplied in selected quality. Selected Natural Figs are calibrated and hand-selected; contain only a trifling percentage of slightly damaged fruits. They are supplied in 12 kg boxes and in linen or cellophane or polythene bags of 500 g or 1 kg. The price depends on the number of fruits per kg, which goes from 34-36 to over 100, but of course also on the category (EXTRA, FANCY, CHOICE). Lerida figs are flattened and lined up in their packing which is bulk boxes or cartons of 10 kg but also trays, carton boxes and cello packs of various weights. Protoben figs are the long shape given to the fruits during manipulation. Protoben figs supplied in 12,5 kg to 14 kg boxes or cartons, but are packed in trays, carton boxes or cello packs of various weights as well. Pulled fig are strongly stretched and given a semi-spherical shape. This kind requires specially selected figs and the pulled type is therefore one of the best qualities. Pulled are packed in bulk boxes or cartons of 12,5 kg to 14 kg as well as in small carton boxes or cello packs of 250 g, 400 g and 500 g.
Baglama figs are similar to the Protoben type but bound together with a raffia string, each fruit being tied by the stalk. The arrangement in the boxes or cartons of 12,5 kg to 14 kg is the same as for the “Protoben”. “Baglama” can be packed in small trays or packs of 500 g as well. Garland figs have got the same shape as the “Lerida” type, but have been strung on a raffia string. The only packages are generally round shape cello packs of 250 g, 400 g or 500 g.
Layer figs are torn from the stalk on and are stretched in order to give them a large and flat round shape. They are then placed layer by layer and pressed into a parallelepiped block. Those blocks are finally wrapped into cellophane and placed into boxes or cartons.